I thought she wouldn't have a last name lol. A fool and his money really ARE soon parted. All hail Blue! The chosen one has arrived! The time of reckoning is at hand. 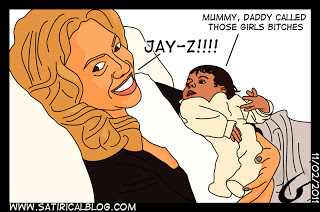 Blue Ivy? That's a great stripper name. Blue came due, name is sad it's true. Cool blog! Check out mine too! poor kid, reality will be twisted as f for it. Ah – Irony – yes I see……. It's like goldeny or silvery but with iron instead. People should stop fussing over other people's babies. I really have no idea who any of the people mentioned in this post are. i am aware of their names, but couldnt pick them out of a line up. im assuming at least one of them is a rapper of some sort. might be the baby. A solid gold rocking horse shames my old wooden rocking giraffe. Perhaps, as her first miracle, she will change some "bling" into baskets of chicken and watermelon. Mummy, why does Daddy like Popeye's fried chicken?